Brexit will undoubtedly affect the EU’s Member States in different ways, but trying to quantify or even just schematise the impact it will have is immensely challenging. In a 2018 study, the European Committee of the Regions assessed the likely impact of the UK’s withdrawal from the EU on regions and cities in the EU27. Some Italian regions figure among those EU regions that could be most affected by Brexit, especially in the sectors of machinery, textile and furniture (for example, Emilia-Romagna, Tuscany and Marches). The results of the study confirm what Italian businesspeople have said ever since the referendum: Brexit impacts the Italian (export) economy. With Brexit, Italy becomes the third biggest economy in the EU. However, given its political instability, this is only a theoretical promotion. Businesses are therefore looking for their own solutions to deal with the implications of Brexit. Not only does Brexit impact Italy’s economy, it also creates uncertainty for the large number of Italian citizens living and working in the UK. According to the Italian embassy in London, many Italians are revising their plans to stay in the UK, or have already left. However, the desired reverse brain drain has not materialised, because the Italian labour market is not able to attract Italians leaving the UK. In general, it is difficult to estimate how many Italians live in the UK and to grasp what they intend to do. This because not all of them are registered as Italians residing abroad. By law, Italians residing abroad or intending to do so for a longer period are obliged to register, but not all of them do so, mainly so as not to lose basic rights in Italy. While Italy’s Prime Minister Giuseppe Conte stresses the need for an orderly Brexit and acts as a mediator in the tense relationship between Italy and the EU, his two deputies, Luigi Di Maio and Matteo Salvini, do not miss any chance to enter into open conflict with the EU. The populist coalition government, sworn in on 1 June 2018, aims at a drastic revision of Italy’s longstanding pro EU-policy and the underlying principles and frameworks of the EU’s set-up. Unlike preceding governments, the current government formed by the anti-establishment party Five Star Movement (Movimento Cinque Stelle – M5S) and the right-wing party League (Lega) is anything but EU-friendly. Both deputy Prime Ministers, Luigi Di Maio (M5S) and Matteo Salvini (Lega) personally support referendums on fundamental questions about the EU, though they are not currently on the agenda. Back in 2016, neither leader hesitated to congratulate the UK’s political elites and electorate for being so courageous in, on the one hand, consulting the electorate over such an important question, and on the other starting the process of regaining sovereignty over the country’s own fate. In social media posts, they stressed that Euroscepticism had at last picked up steam, and that Italy should follow the UK’s example in using referendums for fundamental decision-making. Academics and political analysts barely addressed the question of whether direct democracy was the right remedy for political disenchantment – partly because the media failed to draw attention to the issue. They have mainly confined themselves to evaluating its implications for UK’s parliamentary sovereignty, and on Italy. 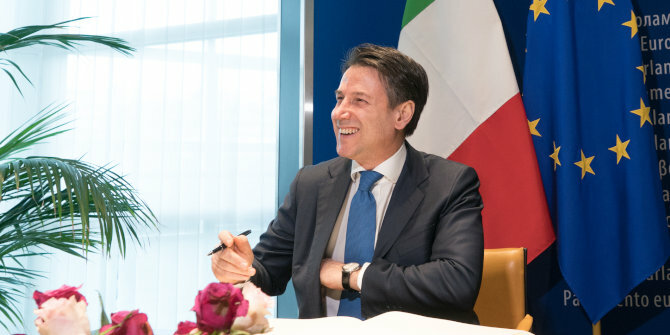 The chance to start a debate on how to renew decision-making processes within the EU and its Member States was missing, in part because of the political turmoil that characterised Italy between 2016-2018 (constitutional referendum on 4 December 2016 – resignation of Matteo Renzi as Prime Minister – 64th Government under Paolo Gentiloni – general elections on 4 March 2018). In most western EU Member States, the public reacted with incomprehension to Brexit. This was not the case in Italy. According to data from 2016, Italians showed understanding for the UK’s desire to withdraw from the EU (Poli 2016). Figures from the November 2018 Standard Eurobarometer 90 (European Commission 2018) confirm the mistrust of Italians for the EU, but do not reveal to what extent Italians support the coalition government’s narrative on the EU. In short, the level of trust and mistrust remains unchanged in comparison with the spring 2018 survey. When asked what the EU should worry about most, Italians rank migration, unemployment and economy at the top, while nationally, Italians rank unemployment first, then migration and the economy. Interestingly, Romania and Italy are the only states where one in five respondents are against the principle of freedom of movement (overall, a large majority of EU citizens are in favour of it). Respondents in all EU Member States (strongly) support the use of the single currency (a new high since 2004!). In Italy, 63% support the euro. This is a rise of two percentage points compared to spring 2018. Asked whether they feel they are citizens of the EU, Italians are among the citizens with the lowest figures. Only 59% of the respondents answered positively. The analysis of Italian narratives on Brexit and the EU shows that there is no clear answer to the question of how friendly or hostile to the EU Italian stakeholders are. At present, views and insights are subject to populist reflexes, and Brexit is discussed on the margins. In theory, the coalition’s Eurosceptical roadmap is already drawn up. In practice, the governing parties are running the gauntlet between their own political crises in Rome, and those with Brussels. A variety of contradictory narratives is the outcome and reconciling them seems impossible. Much will depend on the outcome of the EU parliamentary elections on 26 May 2019. Note: This article first appeared on our sister site, LSE Brexit. It gives the views of the author, not the position of EUROPP – European Politics and Policy or the London School of Economics. The post summarises the results of a research project led by the Department of Political Science of the University of Erlangen-Nürnberg. The detailed results are published in German (Elisabeth Alber, “Italien und der Brexit: Europapolitische Ansichten und Einsichten im Triennium 2016-2018”, in: Thorsten Winkelmann/Tim Griebel (Hrsg. ), Der Brexit und die Krise der europäischen Integration. EU und mitgliedstaatliche Perspektiven im Dialog, Nomos, Baden-Baden, 2018, 177-189). Elisabeth Alber is Senior Researcher at the Institute for Comparative Federalism in Eurac Research.